Twenty national award ceremonies, a global event and a large community of social entrepreneurs around the world? Can you even unite all of that on just one social wall? 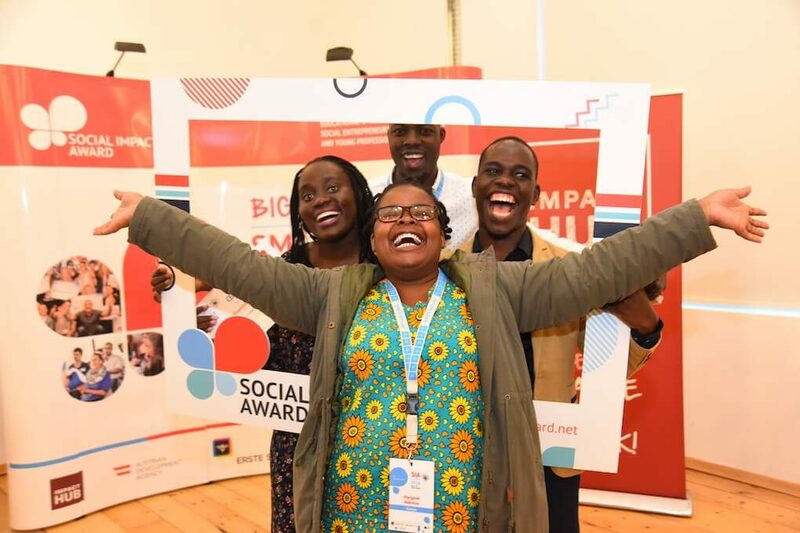 Social Impact Award shows us how a social wall helped make their social entrepreneurship program more social by allowing participants to connect and share experiences no matter where they are. Social Impact Award supports burgeoning social entrepreneurs all over the world by offering various education and incubation programs that help them develop their ideas. Since 2009, Social Impact Award has been teaching participants necessary skills. Furthermore, the programme is providing young entrepreneurs with access to the networks they need to succeed. The best teams of Social Impact Award 2018 were honoured at national award ceremonies in 20 countries. And in November 2018, Social Impact Award gathered participants from all over the world in Tbilisi, Georgia for the SIA Summit. The summit offered another opportunity to further these SIA projects and connect teams with experts and mentors. We’re happy to say that Walls.io played an important part in connecting all those participants — both at the national award ceremonies and the SIA Summit itself. 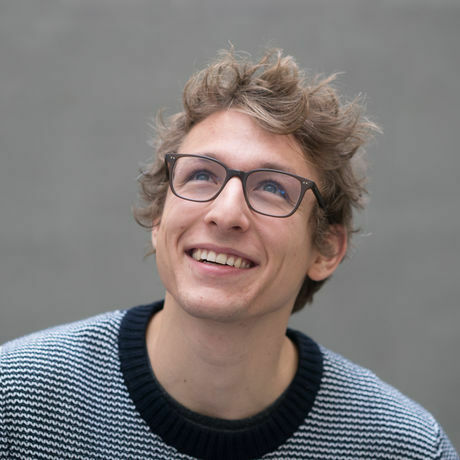 We had a chat with SIA Managing Director Jakob Detering to find out more. Could you tell us more about how you used Walls.io for Social Impact Award? We used Walls.io in two different settings. First, we integrated the wall at our 20 national Award Ceremonies for Social Impact Award. Social Impact Award is one of the largest communities worldwide for early-stage social entrepreneurs. After an intense full-year education and incubation program, the best 60+ ventures got awarded in 20 national Award Ceremonies at the beginning of October 2018 — from Geneva, Switzerland to Almaty, Kazakhstan; from Nairobi, Kenya to Prague, Czech Republic. Secondly, we used the wall at our global flagship event, the Social Impact Award Summit 2018. The event brought together all the winning teams plus a broad range of other SIA community members in Tbilisi, Georgia in November 2018. How did the social wall help connect attendees from 20 countries? What are the challenges when running and moderating a multilingual social wall? The vast majority of participants did not know each other before the event. So, we used the social wall primarily to help participants connect and co-creatively share the experiences and encounters they made throughout the event. The social media wall was screened non-stop in the main hall of the venue and everybody was invited to post in English only. What was your main goal with the social media wall? It was primarily meant as a tool that should support the convening aspect of the event. The wall is perfect in bringing participants together in a fun and personal manner. I can only recommend Walls.io to anyone who wants to bring participants coming from a broad range of countries and cultures together — whether virtually like during our national Award Ceremonies in 20 countries in parallel or in real life like we did during the SIA Summit. Make your event more interactive and talked about! How did you motivate people to use the hashtag? How and where did you promote the hashtag and the wall? The hashtag #SIAwinners2018 was visible all over the venue. We created posters with the hashtag and below each slide of all presentations and sessions, the hashtag was promoted as well. We even shared the hashtag in the week before the event, so participants used them already during their travels to Tbilisi. And one more tip: We created a social media frame to encourage participants to create and share content and it worked incredibly well. 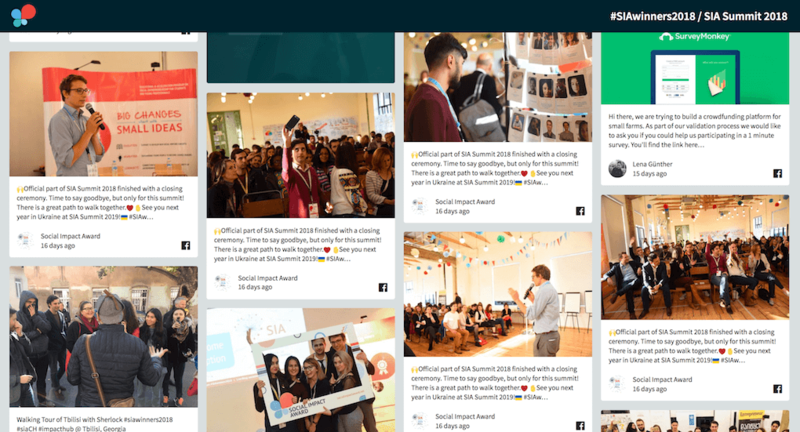 Social Impact Award’s experience with their social wall and hashtag really shows what I have been harping on about on this blog for years: if you want your social wall to succeed you have to promote the hell out of it. 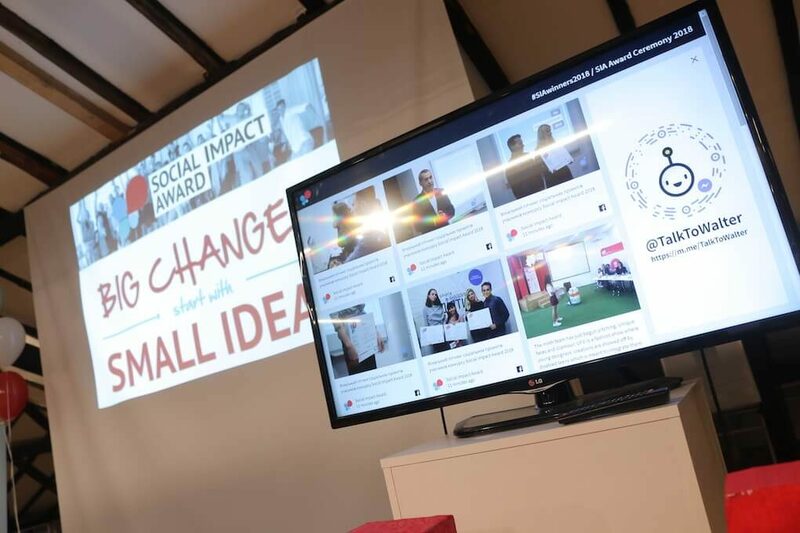 By informing participants about the social wall ahead of time, the Social Impact Award team ensured an early adoption of the hashtag. They did this both at the national events and in the run-up to the global conference in Tbilisi. By the time participants arrived at the SIA summit, the wall was already populated with lots of travel posts and posts from earlier on, encouraging everyone to get and stay involved. Creating a social media frame at an event is also a great move. Props like that, as well as photo booths, make it so much easier and more welcoming for participants to start posting their pics. They also remind people that there is a hashtag, just like the posters at the SIA Summit did. Social Impact Award is also a great example for everyone wondering whether multiple national events need separate social walls or not. Of course, sometimes separate walls are necessary and work better. But in this case, creating one global wall and using it for a whole range of events allowed Social Impact Award to get a head start on connecting participants from all over the world. The unified global wall strengthens the community and gives everyone a chance to connect with other participants. Set up a social media live feed for more engagement and fun. Get a free Walls.io account and set up your wall. It only takes 5 minutes.